Today’s AM fix was USD 1,732.75, EUR 1,327.27, and GBP 1,078.86 per ounce. Yesterday’s AM fix was USD 1,748.00, EUR 1,331.71and GBP 1,081.42 per ounce. Silver is trading at $32.37/oz., €24.90/oz. and £20.24/oz. Platinum is trading at $1,632.50/oz., palladium at $633.75/oz. 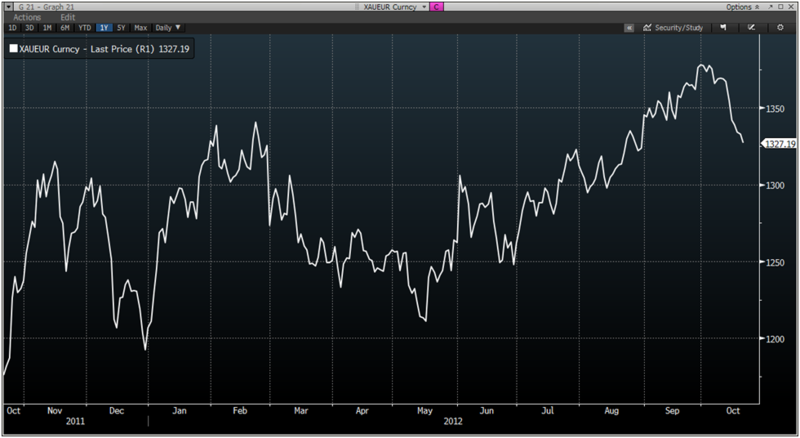 and rhodium at $1,175/oz. Gold fell $7.70 or 0.44% in New York yesterday and closed at $1,741.00. Silver slipped to a low of $32.67 and finished with a loss of 1.24%. The yellow metal is heading for its second weekly fall, its peak year to date at $1,795.69/oz in October but a recent rebound in the dollar and uncertainty in Europe has pared back gains. In September 2011, gold hit a lifetime high of $1,920/oz. EU leaders committed to establishing a euro-area bank supervisor by year-end, leaving the door open for supplying direct aid to Spanish banks.